It seems like these days drones are everywhere. When we first started really hearing about them, it was in relation to military efforts. Now, however, drones are way more mainstream, and they’ve been approved for use in filming, plus companies like Amazon want to use them to make home deliveries. While they’re being used for more things, drones haven’t hit the population at large yet. However, one company is trying to change that by creating a camera drone that you can wear on your wrist. Wait — what? That’s right, a wearable drone. Nixie is still in development, but it recently won Intel’s wearable technology contest, which isn’t surprising considering it’s definitely an idea the world hasn’t seen yet. At first glance, Nixie looks like a watch or a bracelet. But inside that bracelet are four tiny copters, and a camera. 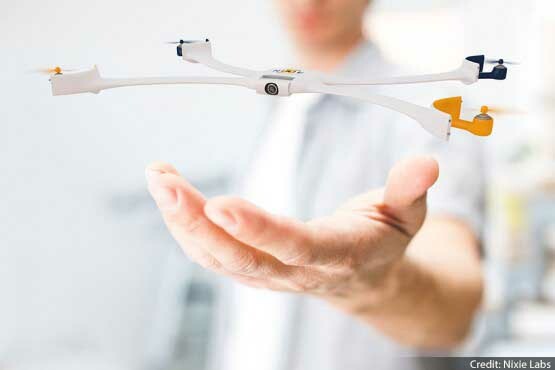 Once activated, Nixie will fly off of your wrist and take pictures of you. The pictures then get uploaded to an app, and Nixie will fly back to you and land safely on your wrist. i would want a watch like that.. a watch that watches you now how crazy is that. I want on of these for christmas!!!!! They are so cool! I definitely think that these will be the next big thing! It would be awesome if this had a mini speaker on it and you could send it off to find help if you’re hurt or in trouble. I want my memories last as long they can be for me to look to the past. Yes, this would be the next big thing because when you want to take a selfie on a cliff or a high point the watch will fly and take a selfie for you so you don’t have to worry about dropping your phone. What if you wanted to take a selfie while on a mountain climbing?? We should have a drone because we could drop our phone while trying to take a selfie on the mountain. Now do you think we should have selfie drones?? This would be the next big thing because the watch can help you take a selfie without being scared to fall of a clif of drop your phone. We should have these because what if we wanted to take a selfie with our phone? Then what if you dropped it? Your phone would break and so we should have the drones. Yes because we all want to remember as many memories as we can and nexie lets everyone do that. This is a great idea, and is the next big thing. Yeah let’s fly it up!! nixie is the coolest “camera helicopter” ever! it would be easier to take pictures way up high. it’s the future’s NEXT BIG THING. The Nixie Watch is definitely the Next Big Thing. This is a divise that could take us to the future. What if they sent the drones into space!? Imagine the possibilities! They could be like mini satellites taking HD pictures! I’m positive that the drone will be overpriced at first, but over time, the price will go down and it will become less expensive. Plus, HOW ON EARTH COULD THAT BE LAME! ?